CarGurus has 1,957 nationwide XJ-Series listings starting at $3,499. For more than 40 years, Jaguar's flagship XJ-Series has duked it out with the top luxury sedans from competitors like Mercedes-Benz, BMW and Audi. The current XJ, which last received a generational makeover in 2009, gets a number of upgrades for 2014, mostly focused on second-row comfort. The upgrades, designed to push the XJ's level of interior luxury to new heights, include available rear airline-style seats, which recline up to 11 degrees and feature lumbar adjustment, memory settings and 3 massage programs. Once adjusted, the rear seat returns to its original position by pushing a home button on the door panel, making it easy to exit the vehicle. In addition, the center armrest between the two rear seats includes controls for adjusting the front seat to create more legroom. Other upgrades for 2014 include an optional 5-level massage feature for the front seats, an optional rear-seat entertainment package with dual 10.2-inch screens inserted into the front-seat headrests and an updated rear suspension designed to improve ride comfort for rear-seat passengers. Together, the features enhance the XJ's reputation as an upscale touring saloon, as the automaker calls it, in a nod to the sedan's British heritage. For 2014, the XJ continues to come in Base and Supercharged trims on the regular wheelbase, and L Portfolio and L Supercharged trims on the long wheelbase. Owners can also add Jaguar's Instinctive All Wheel Drive (AWD) system to the Base and L Portfolio trims. Both of the Base trims and the L Portfolio AWD continue to receive a 3-liter supercharged V6 engine, which produces 340 hp and 332 lb-ft of torque at 3,500-5,000 rpm. It pushes the XJ from 0-60 in 5.7 seconds on the standard rear-wheel-drive (RWD) platform and 6.1 seconds with AWD. The Portfolio RWD trim upgrades to a 5-liter naturally aspirated V8, which puts out 385 hp and 380 lb-ft of torque at 3,500 rpm. When equipped with the V8, the XJ's 0–60 drops to 5.4 seconds. The Supercharged trims get a supercharged version of the 5-liter V8, which pumps up hp to 470 and torque to 424 lb-ft over a wide range from 2,000–5,500 rpm. It drives the XJ to 60 mph in just 4.9 seconds. In all trims, the engine mates to an 8-speed ZF electronic automatic transmission with a Sequential Shift manual-shift mode and steering-wheel-mounted paddle shifters. Jaguar limits top speed for the Base and Portfolio trims to 121 mph and 155 mpg for the Supercharged trim. Fuel economy numbers top out at 18 mpg city/27 highway for the Base RWD trim and fall to 16/24 for the Base AWD, 16/25 for the L Portfolio RWD, 15/24 for the L Portfolio AWD and 15/23 for the Supercharged trims. As befitting a flagship sedan, the Jaguar XJ shows off an elegant exterior design that still manages to be sporty, thanks to a high shoulder line, low cabin profile and fastback-style roofline. The front end design remains somewhat understated, especially when compared to competitors like the deep-mouthed Audi A8. The chrome grille, lower air intakes, sculpted hood and standard HID headlights with self-leveling and LED running lights lead the way, while the heated auto-dimming side mirrors include puddle lights and a power-folding feature. LED taillights and a power-closing trunk are among the other standard exterior features. The Supercharged trims get adaptive front lights, cornering lights and intelligent high beams. Soft-closing doors are available for 2014. Jaguar offers the XJ in a total of 15 colors, including Rhodium Silver, Osmium Blue, Dark Sapphire and Carnelian Red. Standard XJ trims ride on a 119.4-inch wheelbase, while L trims stretch out on a 123.4-inch wheelbase. Overall lengths measure 201.9 inches and 206.8 inches, respectively. Aluminum-alloy body panels help keep the XJ's weight down, and as a result, all engines do a good job of moving the XJ off the mark swiftly, although a few reviewers are unexcited about the base supercharged V6, which replaced a more powerful V8 in 2013. The standard-wheelbase RWD trims tip the scales at a relatively light 3,869 pounds (3,957 for long-wheelbase trims and 4,125 with AWD), which helps make the XJ feel like a smaller car, resulting in good handling and agility, according to a number of testers. It accelerates quickly and smoothly and remains ready to handle just about any driving situation with ease. All trims get the JaguarDrive Control system with Dynamic and Winter modes, which helps ensure stability and traction on all types of road surfaces. Jaguar's optional AWD system maintains a rear-wheel bias during normal operation but can send up to 50 percent of torque to the front wheels when necessary to help keep the vehicle firmly planted. Supercharged trims add an Active Differential Control, while all trims get a self-leveling rear air suspension and speed-sensitive variable-ratio rack-and-pinion power steering. Long-wheelbase trims get a revised rear suspension for 2014 designed to improve passenger comfort and reduce overall weight. One of the XJ's best assets remains its luxury-oriented cabin, which matches the best in its class. Unique features like the wraparound dash, Phosphor Blue halo lighting and virtual high-contrast TFT instrument gauges set the XJ apart from its competitors, while an 8-inch color touchscreen in the upper center console makes it easy to control the vehicle's various systems. Soft-grain leather comes standard on all trims, with a choice of 12 colors and three grades. Owners can also choose from 24 interior color themes and 10 types of interior trim. The Base trims receive 12-way power-adjustable front seats, while the Portfolio and Supercharged trims upgrade to 18-way adjustable front seats. Heated front seats and dual-zone automatic climate control come standard in the Base, while the Portfolio and Supercharged get 4-zone automatic climate control and heated and cooled front seats. Other standard features for all trims include leather door trim, an auto-dimming rear-view mirror, remote keyless entry and a 3-spoke leather-wrapped steering wheel with audio, cruise and Bluetooth controls. For entertainment, the Base and Portfolio trims come equipped with a 14-speaker, 380-watt Meridian sound system with HD radio and SiriusXM satellite radio, while the Supercharged trims get a more powerful 825-watt, 20-speaker Meridian audio system. All trims also include a navigation system with a hard disk drive and traffic message channel. Owners can add a new optional 1,300-watt 26-speaker Meridian audio system for 2014, as well as the optional Rear Seat Entertainment system, which now includes dual 8-inch LCD screens, a remote control and 2 wireless headphones. The XJ comes standard with such safety features as 6 airbags, Dynamic Stability Control with traction control and antilock brakes with electronic brakeforce distribution, brake assist and cornering brake control. Safety options include a blind-spot monitor system. The XJ has not been safety-rated by the IIHS or the NHTSA. 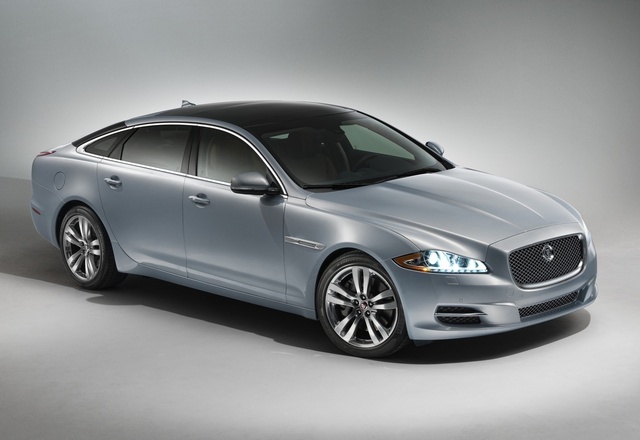 What's your take on the 2014 Jaguar XJ-Series? 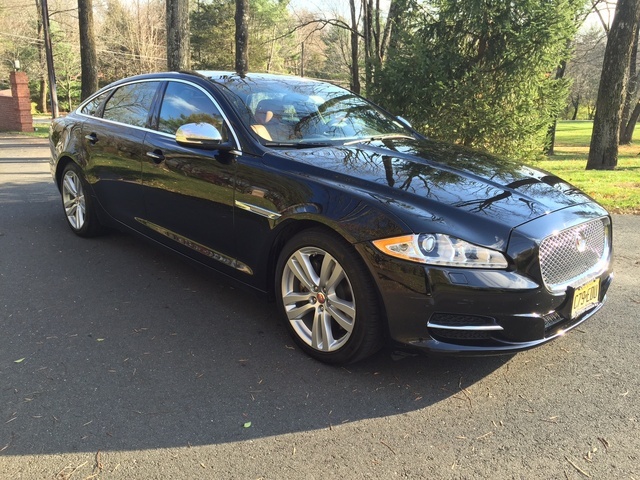 Have you driven a 2014 Jaguar XJ-Series? Do both side mirrors on 2014 Jaguar XJL dip when in reverse? Ours did, drivers side stopped and Jaguar dealer said it never did. HELP!